Potentially 'Historic' Winter Storm Due Across Much Of Nation : The Two-Way Up to one-third of the country, and 100 million people, could be affected by snow and ice starting later today. The dramatic events in Egypt, where anti-government protests are rocking the nation, continue to dominate the news. We rounded up some of the latest developments here, and will continue to follow events as the day continues. — "Potentially Historic And Destructive Winter Storm" Could Affect A Third Of The Nation: "A multi-day, multi-region potentially historic and destructive winter storm will unleash its fury beginning Monday and will last through Wednesday," The Weather Channel warns. "When everything is said and done," the network adds, "the storm may very well impact a third of the population of the United States; approximately 100 million people. Its reach will be felt from the Front Range of the Colorado Rockies to the Ohio Valley to the coast of New England." 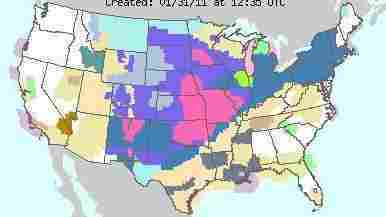 The National Weather Service has state-by-state warnings posted here, and its graphic shows (in pink) where the worst is expected. Update at 2:15 p.m. ET. The Des Moines Register says that "a winter storm will sweep into Iowa beginning tonight and erase memories of a recent spell of warmer weather with an in-your-face brew of snow, wind and cold." "I just sold my last bag of ice melt," said Bob Margherio, owner of Mac Do it Best Hardware in Webster Groves. "I sold four tons of ice melt in four hours this morning." Update at 1 p.m. ET: The Chicago Tribune writes that "the National Weather Service has issued an unusually dire blizzard watch, calling a storm expected to arrive Tuesday afternoon over much of northern Illinois and Northwest Indiana 'dangerous, multifaceted and potentially life-threatening.' ... White-out conditions are expected at times Tuesday night, with snowfall rates of at least 2 to 3 inches per hour possible with northeast winds of 25 to 40 mph and even stronger gusts." — The Denver Post: "Light Snow, Freezing Rain And Fog Settle In Along Front Range." — The Kansas City Star: "Freezing Drizzle Coats Roads North Of Kansas City Area." — Minneapolis Star Tribune: "Snow Blankets Metro Roads; Up To 6 Inches Expected." — Chicago Sun-Times: "Blizzard Watch In Effect, Could Drop 18 Inches Of Snow In City." — The Indianapolis Star: "Ice Storm Could Blow Into Town With 35-mph Winds." — The Buffalo News: "Winter Storm Headed Our Way." — Friends Predict Rep. Giffords Will Return To Washington: As Rep. Gabrielle Giffords (D-AZ) continues her rehabilitation from severe injuries she received in the Jan. 8 shooting rampage at a meeting she was holding in Tucson, friends tell the Houston Chronicle that they believe "the ebullient three-term congresswoman will battle back from her injuries and return to Washington." Giffords, 40, is being treated at Houston's Institute for Rehabilitation and Research. Nineteen people were shot in the attack by a lone gunman. Six people died. "We don't go after a particular country. We don't go after a particular organizational group. We just stick to our promise of publishing the material that is likely to have a significant impact."